I’m about to finish my first work experience placement after my NCTJ course in Brighton. I finished the course on the Thursday then on the Monday I was sitting at the news desk with my pad full of story ideas. P.S. In other news, I have got access to This Festival Feeling to fulfill my recent role as news editor so daily news stories have been going up for a few days and will continue to do so. A Parkinson’s sufferer who smashed into the back of a police officer’s car was fined £48 and given six penalty points for careless driving. Anthony Patrick Lea, 49, of New Ruttington Lane, Canterbury pleaded guilty to the July 22 incident at Canterbury Magistrates’ Court on Monday. Julie Farbace, prosecuting, said Mr Lea hit the vehicle when it was behind a bus stopping at a bus stop. The emergency services were called but there were no serious injuries. In a letter to the courts Mr Lea said: “I didn’t mean to have an accident. Mr Lea has since stopped driving on the advice of his doctor but has retained his licence. A man on licence for possessing thousands of pounds worth of drugs was ordered to pay £85 costs for two charges at Canterbury Magistrates’ Court on Monday, December 19. Ahab Halim, 35, of Downderry Road, Bromley pleaded guilty to having 13.6g cannabis resin and 10.27g cannabis with intent to supply. Julie Farbace, prosecuting, said Mr Halim was seen on a bicycle with no lights by two police officers in Herne Bay High Street at 11.30pm on March 17. He beckoned to them and when they smelt cannabis, he admitted possession of the Class B drug worth £150 and said he had sold £40 of the drug that night. Anton Walden, defending, said Mr Halim had “left his old life behind” and was reconciled with his partner and nine-year-old daughter. The charges were made before he received his current sentence and since then he had taken on the role of house-husband. A 22-year-old woman from Burgess Hill, who toured Europe and Japan as lead singer of a band before becoming a journalist, scooped a prestigious award last night. Scarlett Wrench, who spent sixth form at Varndean College, won Student Journalist of the Year at the NCTJ Society of Editors’ conference. Scarlett recently completed her NCTJ certificate at Brighton Journalist Works and now works on Men’s Health Magazine. Scarlett was lead singer of band The Malchicks and featured in the Argus four years ago when her band released an album in the UK and America. Scarlett was one of two members of the journalism society at school and recalls drafting press releases about Varndean College and sending them to the Argus. 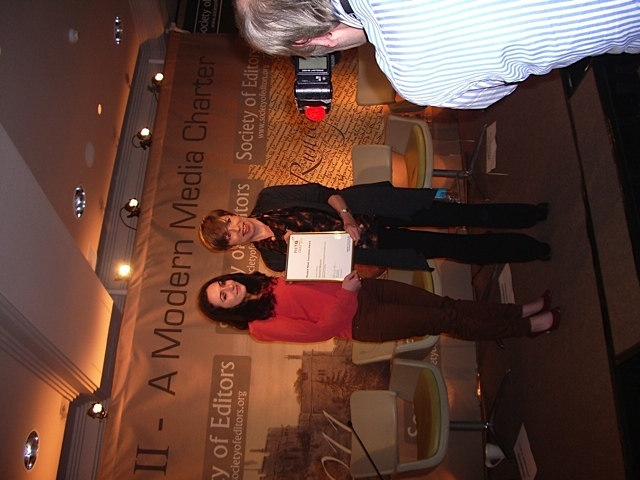 Scarlett Wrench has just won Student Journalist of the Year at the NCTJ Society of Editors Conference today. She is 22, from Burgess Hill and studied at Brighton Journalist Works. I interviewed her about this prestigious award and will publish the article I have written for tomorrow’s Argus on my blog tomorrow. Congratulations Scarlett. How does it feel to win this award? I’m very flattered. My award entries were stories I wrote while on my internship with the Crawley Observer, one of my local papers. I owe a lot to the people I was working with there for trusting me to take on some of the bigger stories – rather than just leaving me to make tea and chase up missing cats. Who was the first person you told when you found out you’d been shortlisted? I was with my Mum when I found out. She’d been eyeing up the letter for a while, clearly having guessed what it might be. I had no idea what the letter was for when I opened it, so there was no dramatic build-up. I’ve had a bit too much to celebrate recently – my new job, leaving home for the first time, turning 22… I’ve brought my Grandma to the awards to thank her for paying for my journalism course. I was a bit of a swot. I took my work very seriously – maybe too seriously! I wouldn’t say that I enjoyed school and I’m definitely having a better time now that I’m out of it, but I think I made the best of things while I was there. How was your time studying at Varndean College? I was a member of the journalism society (there were only two of us, it really wasn’t a very popular club) and I used to draft press releases about college goings-on and send them to the Argus. I’d probably been reading too many books and had an idea that a career in journalism would be all Hemingway and Hunter S Thompson. Then I went to work on a local paper and quickly realised it wasn’t going to be much like that. Journalism is long hours in front a computer screen, looming deadlines and re-writing the same paragraph five times in one day. But I love it and I don’t even remotely regret going down this path. How is your job working on Men’s Health? I love it. It still feels slightly surreal sometimes, to have landed a job like this at a time when finding work is so difficult for people my age. I’m working quite long hours and the commute is a bit wearing, but it’s well worth it. And no one takes me any less seriously because of my age or lack of experience, which I’m grateful for. I’m enjoying the opportunity to work alongside so many talented people and for a publication that has a real chance to affect people’s lives. I’ve always been more drawn to men’s magazines than to magazines aimed at women. On the whole, men’s mags just tend to be funnier, more varied and a little less patronising – I don’t know why that is and I hope it’s not always the case. What would be your best piece/s of advice to any aspiring journalists? Get out there and do it. Don’t just learn about it. Get some real-world experience. What made you choose the NCTJ route rather than university? I didn’t want to be out of work for two years and end up saddled with a load of debt. I studied for my NCTJ part-time, so I was able to work about 25 hours a week in my local pub at the same time. It helped me retain some kind of independence. What would you say to anyone thinking that maybe the university route isn’t for them? Well, I’m no expert, but I think anyone would agree that so long as you work hard, stay focused and persevere in whatever it is you want to do, you can’t go far wrong. What grades did you get on the NCTJ course? News Writing was a B. All the others (Law, Public Affairs, Subbing, and the Business of Magazines) were A grades. What was your favourite portfolio piece? At Esquire magazine they let me write the contents page for their November issue and it managed to make it past the editor with relatively few changes. It felt very cool to see that in print. Where was your favourite place to do work experience and why? Esquire. It’s a magazine I have always enjoyed and admired, and that’s where I caught the ‘subbing bug’. It’s also where I met Emily Miles, who is now production editor at Men’s Health and who recommended me for the job. I owe a lot to Emily and to Esquire’s chief sub Jeremy White for their advice and support. I’m not writing much at the moment because I haven’t had the time, so ultimately I’d like to strike a balance between subbing and writing… and maybe be a production editor myself in five years time. If it’s of any interest to you, before I went down the journo route I used to be the lead singer of a band called The Malchicks. In 2007 we released an album in the UK and America, and we toured Europe and Japan. I also worked as a backing singer for cult 60s R&B band The Pretty Things. I’m telling you this because The Argus ran a story on me and the band about four years ago… they might even still have a slightly moody photo of me standing outside Varndean college!